Source: Jimmy Bannos Sr. and John DeMers, Big Easy Cocktails: Jazzy Drinks and Savory Bites from New Orleans (Berkeley: Ten Speed Press, 2006), 59. 01. Combine all the ingredients except the pecans in a blender and blend until thick and smooth. 02. Pour into a stemmed glass* and garnish with pecan pieces. 03. Serve immediately with a straw or spoon because this is not a beverage that can be sipped delicately. * Stemmed glass includes balloon wine glass, beer goblet, frappe glass, goblet, and parfait glass. 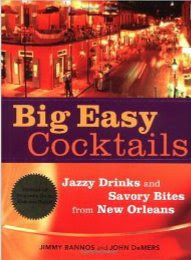 1 Source: Jimmy Bannos Sr. and John DeMers, Big Easy Cocktails: Jazzy Drinks and Savory Bites from New Orleans (Berkeley: Ten Speed Press, 2006), 59.